Well, not really but we may as well goddamit be! Currently Mini Me is resembling a spotty dotty having caught Chicken Pox and we are enduring this nightmare as best we can! Fortunately, Mini Me is of an age now where she understands the lifetime repercussions of scratching at the spots, especially the few that currently adorn her face. In all fairness, we have got off very lightly in comparison to many cases friends have told me about. Mini Me has remained very upbeat in herself, with many laughs and giggles over the past few days, it has just been the easing of the spots and the itchy stage that we have been preparing for. I was not prepared for how stir crazy I would be though, it has made me realise how much I love getting out and about, actually seeing faces and having a proper adult conversation. Even a trip to stock up on a few food items from the supermarket was a logistical nightmare… as I said, we are pretty much under house arrest for fear of anyone else catching the pox. Friends recommended stocking up on Piriteze, a liquid form medicine that will help ease itching as and when needed. I purchased this from Boots (current price £5.29), though I am sure you can pick this up in most chemists and large supermarkets. The same as Poxclin Mousse (currently priced at £10.99), another recommendation as opposed to Calamine Lotion. Suitable for larger areas and quickly absorbed into the skin, Poxclin help to reduce itchiness and improves the condition of the skin. So far, I have found that it is much easier and less messy to apply the Poxclin than Calamine lotion and Mini Me appears to like it. Under no circumstances should you give your child Ibuprofen based products as this could cause adverse skin reactions during chicken pox! As soon as you notice the dreaded chicken pox spots, run a bath and let your child have an extra long bath. 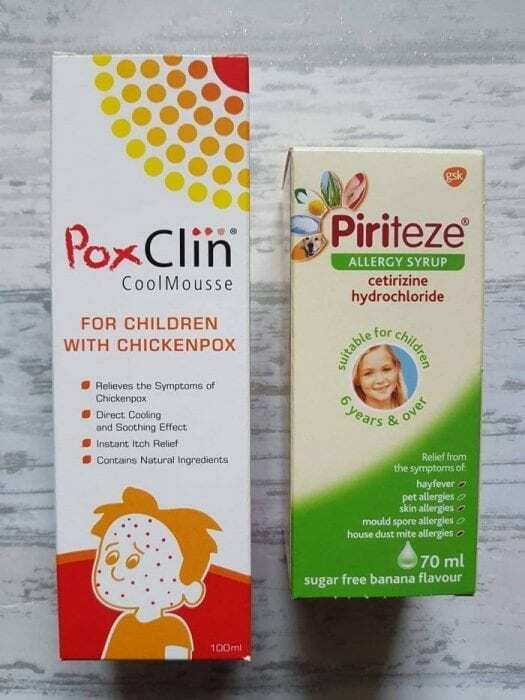 Not only will the water help to soothe their skin but it also encourages the chicken pox spots to form and appear quicker. Thus allowing you to treat the spots and help prolong chicken pox. This is recommended for each day. Whatever you are watching at the moment, be prepared to watch a lot of it! I have jumped from Vikings (the lead character played a starring role in the recent Friday Fit Bit), Game of Thrones, Scandal, Madam Secretary and Suits. Total mainstream watching, however as everyone else is watching the programmes, at least I can have a debrief about them via chat – helping me to keep in touch with the outside world! You will no doubt find that your child will graze whilst coping with Chicken Pox. The spikes in temperature and generally feeling under the weather may mean that smaller meals at different times will help! Ice pops have been worth their weight in gold and help to cool Mini Me down and keep her upbeat. You may find that your child has chicken pox in their mouth, in which case you will be thanking me for the Ice pop tip!